I developed a social media strategy to increase activity on CYC’s Facebook page after it had been left stagnant for almost a month. I created a 14-day promotional campaign, which profiled CYC’s 16 Outstanding Student Award nominees and led up to the announcement of the three scholarship winners. The campaign reached an average of 715 people by the end. 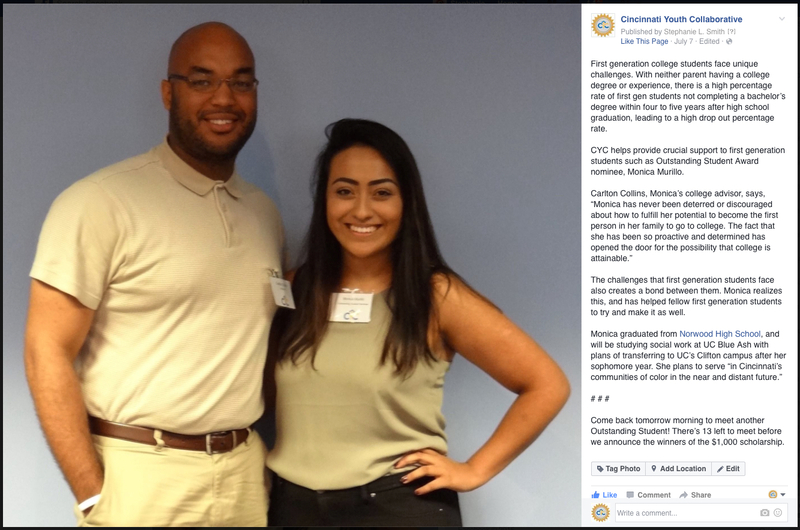 I coordinated writing and posting duties with CYC’s communications and marketing specialist. The content included a highlight of the nominees’ background and how they overcame adversity to make it to college; where they will be attending college; future plans; and a quote from their nominator on why they’re an outstanding student. I wrote the above profile, but the communications and marketing specialist wanted to post it from her Facebook account to see why she was reaching more people than I was. Her posts were reaching 500 to 600 people while my first few profiles reached about 50. My profile on Jayren Andrews reached over 2,800 people; received over 50 likes; and had over 20 shares.